EF Studio 5 Color Lip Pallette Only $4! You are here: Home / Great Deals / EF Studio 5 Color Lip Pallette Only $4! Don’t miss out on this great deal at Modnique! 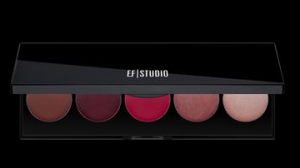 EF Studio 5 Color Lip Palette Only $4! This and other great EF Studio Cosmetics are on sale at up to 70% off their retail prices! I picked up some of their eye color a few months back at this price and absolutely love the quality! Grab this and other great deals every day at Modnique!